Welcome back to Day 5, everyone! Today we get to hear from Karin who blogs over at the fabulous Nordic Craft! She shares everything from fun craft projects, beautiful photos, and fun recipes on her blog. Karin has participated previously with her wonderful post on Smallkarameller, and I'm so excited to have her back again! Hi everyone! I'm Karin, I'm a Swede living in Stockholm. 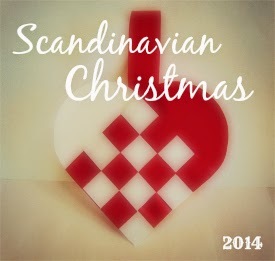 When Kathryn approached me to contribute another post to her brilliant Scandinavian Christmas series, I was delighted. Now, I'm not very traditional when it comes to Christmas celebrations - I don't even eat pickled herring! *gasp* As a vegetarian, I've had to get creative with some of the traditional Swedish Christmas foods over the years, and I quite like updating and developing new Christmas traditions as well. But I do have some family traditions which I come back to every year. Two years ago I shared a tutorial for making my favorite Smällkarameller out of tissue paper here on the Pickled Herring, and every year you will find at least one Yule goat in my living room. 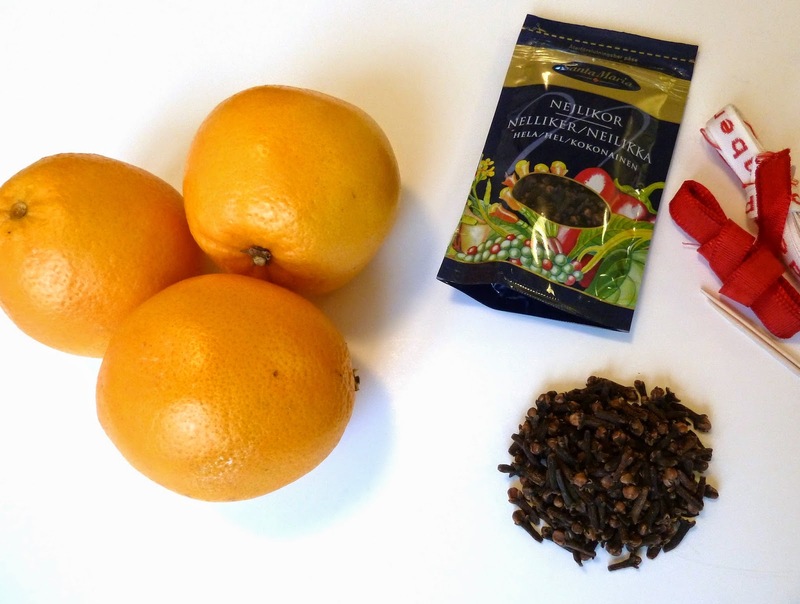 Another Christmas tradition we love in my family is making orange pomander balls. 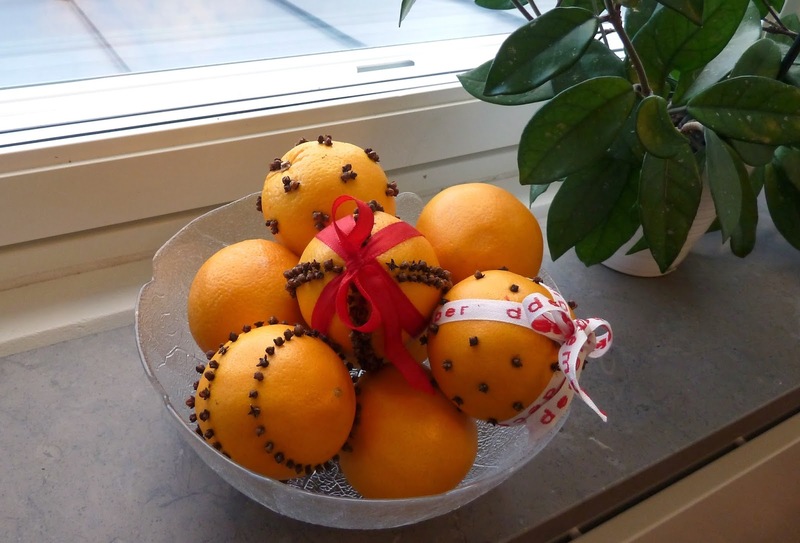 Orange pomanders, oranges studded with dried cloves, are a common sight in Swedish homes around Christmas time - either hung in windows using ribbon, or else lying in a fruit bowl spreading a lovely Christmas fragrance around the house. 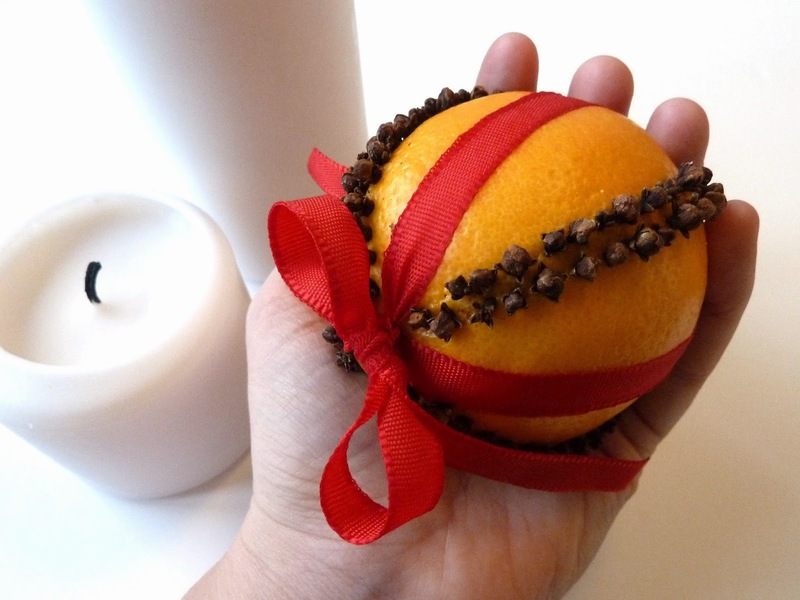 Pomanders are incredibly simple to make, and they will make your home smell amazing! Making pomander balls is incredibly simple, and they can be varied in many different ways. Start by washing and drying your oranges and gather your supplies. Then simply poke the dried cloves into the orange in any pattern you like. 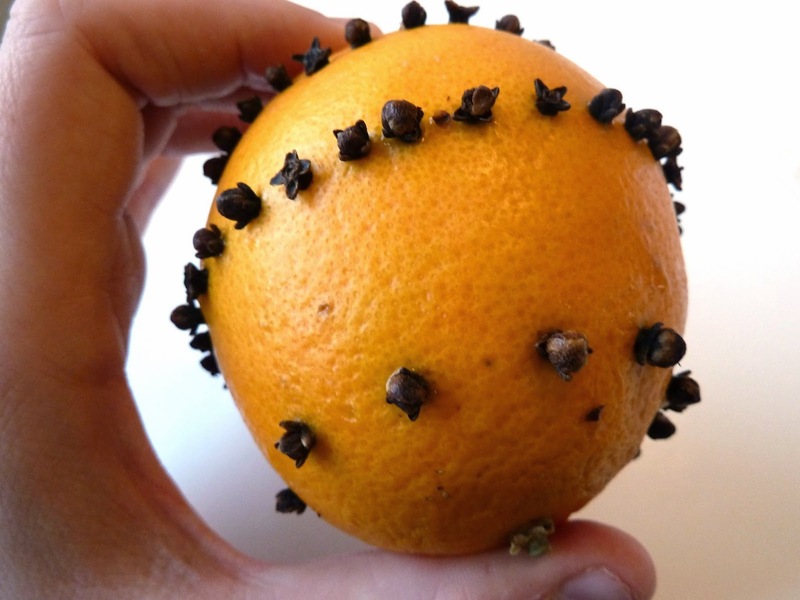 A tip: Especially if you are making this craft with children, consider using a toothpick to score holes in the orange first - this makes it easier to insert the brittle cloves without breaking them. You can put the cloves all over the orange in a random pattern, or you can choose to make lines or swirls. A good tip for making even rows of cloves is to put a thin rubber band around the orange as a guide for where to put your cloves in. A common way to display orange pomanders here in Sweden is to hang them in your window using a red ribbon. 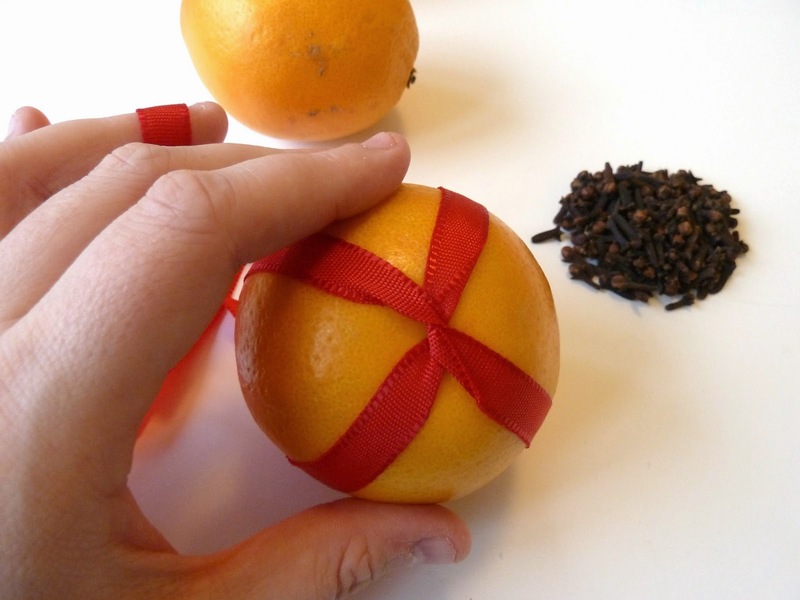 To hang your pomander ball, cross tie a length of ribbon (you will need about two yards) around the orange and use the ends to make a hanging loop. Simple and pretty! Fresh pomander oranges will usually last a couple of weeks if displayed correctly (don't keep them anywhere too warm or humid) and that's usually enough for me, but I have read that drying the pomander balls before displaying them (takes around a week in the refrigerator) will help them last longer. If you're planning to hang your pomanders from a ribbon, keep in mind that the pomander will shrink a bit as it dries, so you may need to tighten the ribbon after a couple of days. Good luck with making your pomanders! Happy holidays! I took my daughters to a Swedish Christmas festival and these pomanders were centrepieces on the table. I picked up the supplies and we will work on our own. Thank you ! I recently ran across some at my mother's house that I had made in girl scouts in the 60s! They were still fragrant! Yours are so beautiful.